Two posts in one week? This must means that I am publishing these on an automatic schedule, since I'm finding it verrrry difficult to keep up lately. 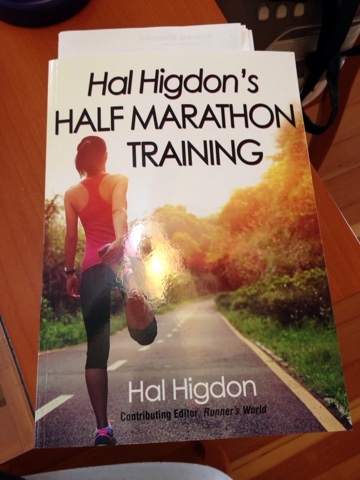 Still, this post is going to be a fun one for me to write because it has to do with running!! I've mentioned this here before, but sometime after the new year, I saw that Mark Zuckerberg started a "year of running" in which he'd try to run at least 365 miles this year. It took me more than halfway through the month to get on board with this, so I was running a lot of catch up and as of last week, I'm at 179 miles for the year, which I believe leaves me in good shape because it's still early May. Most of my miles were on the treadmill, but I'm doing more outside now, carving out paths around my hilly neighborhood. The weather has mostly been amenable to running outdoors (for now! 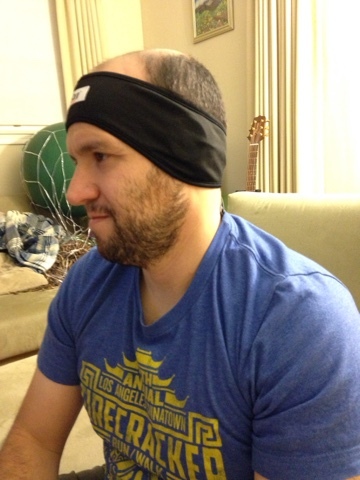 ), though sometimes it calls for this little number from CozyPhones that "The Ukrainian" is modeling nicely since it doesn't quite look right on my larger head and bunchy hair. These are great because there aren't any ear-bud-falling-out moments, and it keeps the cord away pretty tidily. ...because I'm running a half-marathon next month. I already announced this on Instagram, but now it's on the blog record. It was sort of an impulse decision. I had wanted to run my 30th half-marathon (which is what this will be) before I ended year 30, but alas, that did not pan out for various reasons, mostly because I didn't feel I was ready to train or wake up early. Of course, I was also nowhere near in-shape, which also contributed. So I'm STILL not totally in half-marathon shape, but I have done a 5, 6, and 7-milers in my ramp-up because my previous post-partum distance record was about 5 miles that I think I did once last year. I'm going totally "novice" and am probably going to peak at 10 or 11 miles because I didn't have as many weeks as I would have liked to ramp up any higher. So far, the runs have been going fairly well considering this is kind of uncharted territory for me again, and nowadays, I am training on much hillier terrain, which I hope will help carry me through my race since it's flatter. I feel like a beginning again in many ways, as I often second-guess myself. For example, each week that I go another mile longer, I start feeling my favorite ole' right calf tightening. I tweaked my ankle on my last long-run in the trail-y area. Also, I haven't bothered to wear compression socks for this, mostly because I prefer running in pants these days, but I may consider wearing them again starting next week???? And I should probably start carrying hydration with me. I also haven't decided if I want to try to train to finish the race without fuel or not, but whatever I decide, I better start incorporating soon, and all my old energy things are expired. If this was Instagram, I'd be using a hashtag along the lines of #newoldrunnerproblems . As for goals, I am not fast by any means, so I really just want to finish the race in one piece and preferably not be walking a lot. I haven't been walking during my training but fully expect that things can go awry on race day. More specifically, I am hoping I can run this at pace I've been training at so that I don't take forever. Needless to say, I am excited about rounding out my half-marathon count and finally doing something that I missed in my two-ish years of gestating and being a mom. I can't say whether this will be a one-time thing, since yes, my priorities have changed, and it really is a commitment in both time and energy when I do have other goals, too. So we'll see how this next month or so goes. FTC Disclaimer: I was sent samples of the above-mentioned products to review but was not otherwise compensated to provide a positive opinion. Happy Monday, everyone! It's already May, and Mother's Day weekend came and went. It felt really early this year, but then again, everything feels like it sneaks up on me these days. I spent the weekend with my in-laws and niece and the extended version of my nuclear family, and by that, I mean all my sisters and their families. It's always a good time having a bunch of kids under 5 (and mostly under 3) running around my parents' house! And of course, I spent lots of time cuddling my little one, who was getting over a bug and let me snuggle him and cut his nails without a fight! I called the easy nail clipping my Mother's Day gift. I did Sweat Intervals all four times (as prescribed on the calendar) before getting to this review to make sure I captured my feelings about it over time. At the beginning of Sweat Intervals, Shaun T says, "This workout is called Sweat Intervals, and you're about to find out why." At the end, after the stretch portion, he then says, "...come back; don't be afraid." Each time I popped this DVD in, though I was afraid, though. To start off, after the regular warm-up, there is no actual water break, just a brief stretch. Then, the actual workout starts. The first portion involved moving jabs, push-up punches, and squat lunges. You can see a lot of the cast "maxing out" already, which makes me feel better about feeling like death. I can outlast many of them by this point, but it really varies by how I'm feeling that morning. The breaks come about every 5 minutes, and they are much needed by then. 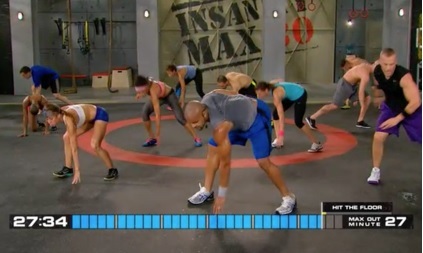 One comic relief in this workout is the appearance of Shanita, one of the original Insanity cast members that I briefly made fun of here because she's always quitting. However, I don't blame her for pooping out early in this video! As the workout goes on, you end up doing things like wide pike-ups (this is usually when I "max out," only about 11-ish minutes into the workout), ski abs, hop-hop runner... it feels like a lot because my quads usually feel heavy and don't really have a chance to fully recover. I guess I'm not supposed to be fully recovering during such a short workout. 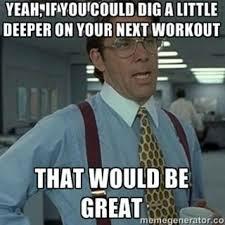 And just when you're kind of dying by the end, squat obliques, hit the floor, and cross-jabs are thrown in. 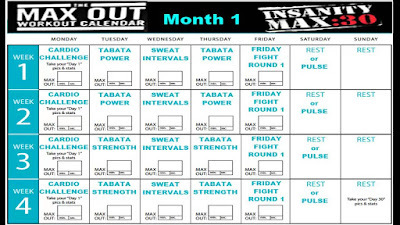 This is definitely one of the more difficult workouts on Month 1, although they are all hard. I just get an extra pang of dread when this one comes up. Also, you're supposed to do the Ab Attack (10 minute that I mentioned in my first post afterward. I think I actually followed through with this half the time due to time constraints that I had on those particular days. Yes, I still battle time issues even with such a short workout... blah! 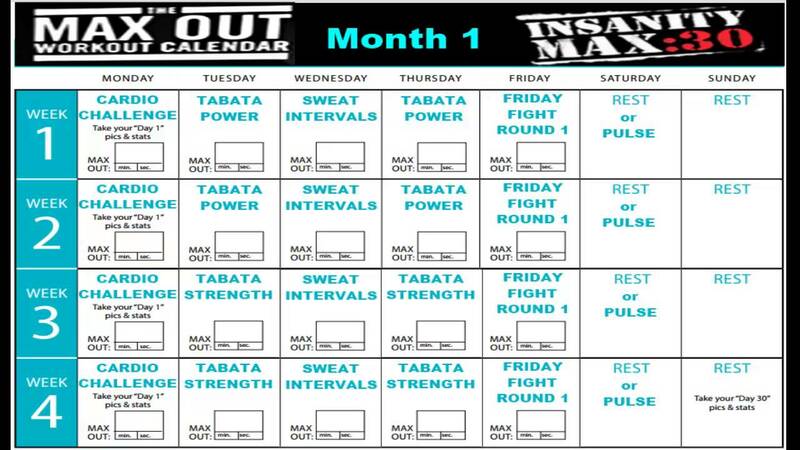 I have two more workouts to review before I get to Month 2, again, trying to go through them a few times before recording my thoughts. I'm pretty freaked out about getting to the next set of DVDs, because as I said, these Month 1 ones are already pretty difficult!